Zug, Switzerland, July 30, 2014 - Paschalis Papagrigoriou, renowned inventor of the microSD smartcard, an electronic gadget enhancing the security in BlackBerry devices sold by Düsseldorf based Secusmart to the German Federal Government, is fast to explain that the term “Merkelphone” which was coined by a journalist back in 2009 means nothing else but a device named “SimKo2” which was co-developed by Papagrigoriou and proved to be inaccessible due to its totally virtualized Windows Mobile operating system. It was replaced as a result of Microsoft’s discontinuation of the OS. It is certainly a smart move for a Canadian manufacturer to integrate a German IT security firm in an effort to bolster its brand image. Secocard, the universal security platform combining integrated Secoder 3G, eID reader capacities and autonomous payment over NFC now introduced as smartwatch. Zug, Switzerland, July 22, 2014 - Immediately after having added an eID reading capacity to his multi-function smartcard reader Secocard, Dr. Paschalis Papagrigoriou, renowned inventor of the microSD smartcard, unveils important security functionality in a zeitgeisty smartwatch named SecoWatch. 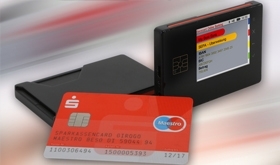 Zug, Switzerland, July 1, 2014 - Dr. Paschalis Papagrigoriou, who invented the microSD smartcard and created the German "Merkelphone“, announced the ability to read the new German ID card (nPA) for the latest release of his multi-function reader Secocard. 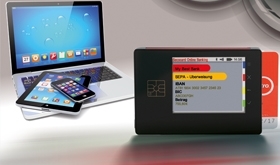 New Range of Products By The Inventor of The "Merkelphone"
Zug, 17.1.2014 - Paschalis Papagrigoriou, inventor of the microSD smartcard and developer of the so-called 'Merkelphone', today disclosed more details about his coming set of IT-security solutions. 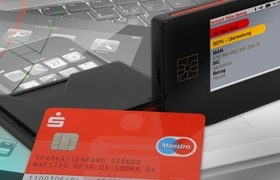 "The retail banking sector in Europe fails to chalk up on innovative home and mobile banking products, while the tools bank customers have in use are being hacked one after one. The credit card industry has no affordable products on offer for retail merchants – whatever is on the market is by far too expensive, even if it works with a mobile phone. And finally, both the public and enterprise sectors lack a choice of really unbreakable security solutions for voice and data communication – more so while smartphones and tablets are becoming ever more complex and new models appear on the shelves almost at the speed of light. Also, with all the big data exploitation and phone tapping scandals in view, you may come to believe they’re not really intended to be unbreakable”, Dr. Papagrigoriou said in his statement to the press in Greece.